Arizona's Northwestern Region contains the Grand Canyon National Park, which is 277 miles long from Lees Ferry to Grand Wash Cliffs at Lake Mead. It averages 10 miles wide and is 18 miles across at its widest and 5 miles across at its narrowest. From the North Rim, you can look down for more than a mile at its deepest point. The Grand Canyon displays about one third of our planet's history, up to two billion years. However the Colorado River has taken only five to six million years to carve the deep, winding corridor through the many layers of multi-colored earth and rock. The canyon also cradles hundreds of ruins from thousands of years of habitation by humans. The South Rim is the most famous and visited point of the canyon, with 90% of all traffic. The North Rim is only 12 miles from the South Rim as the crow flies, but it's more than 200 miles by road. 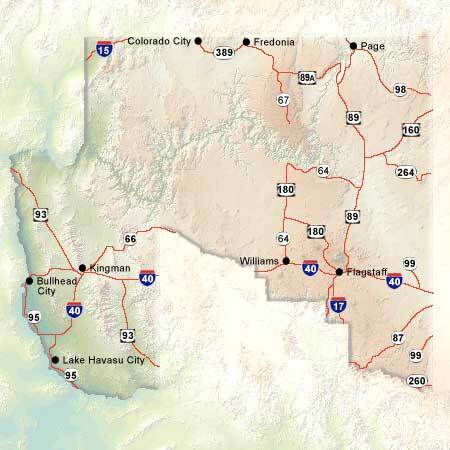 The West Rim includes two remote areas: The Hualapai Reservation and the Havasupai Reservation.